On the desk of Spring ISD Assistant Director of Athletics Armando Jacinto, there's a sign that reads, "A good coach makes players see what they can be rather than what they are." It's a version of a saying attributed to College Football Hall of Fame Coach Ara Parseghian, who led Notre Dame to two national championships in the 1960s and 1970s and was known both for inspiring players to be their best and serving as a friend and mentor to other coaches. It's a leadership model that Spring ISD's Jacinto takes seriously. "That really sums up why we do what we do," Jacinto said of the quote. 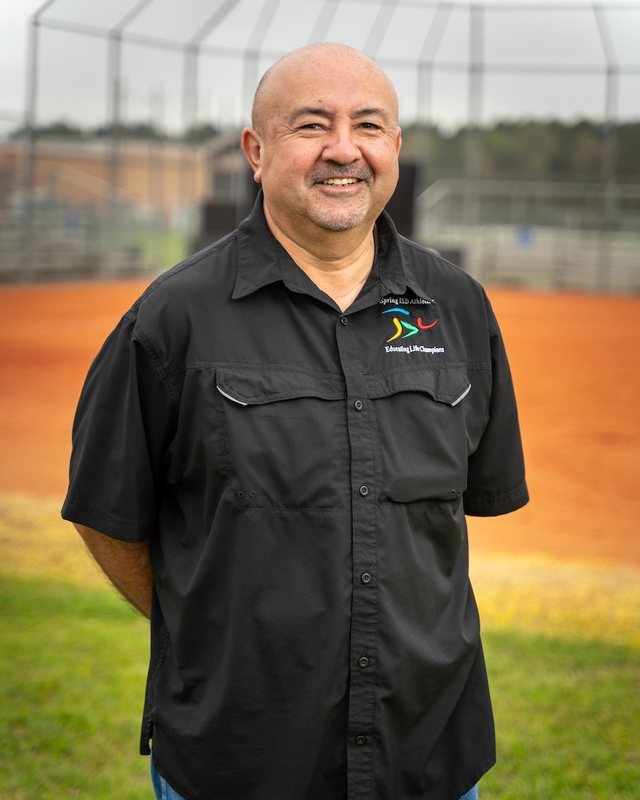 Now, more than three decades into his own career as a coach and athletic administrator, Jacinto - who joined Spring ISD in 2014 after working many years at schools in Waco and Austin - remains committed to personal and professional growth, and to upping his own game as a mentor to others. Earlier this spring, Jacinto was recognized as a Certified Athletic Administrator by the National Interscholastic Athletic Administrators Association (NIAAA). Completing the certification coursework, building the required portfolio, and passing the exam to earn the designation took Jacinto several years, but, according to him, it's a career milestone that's been much longer in the making. "It's a culmination of all the experiences I've had up to this point," Jacinto said. His work in Spring ISD keeps him on his toes and on the move. From working with physical education teachers, to overseeing athletics groundskeepers and facilities, to helping organize middle school athletics programs, to organizing and scheduling competitions and tournaments and helping arrange team travel for out-of-town games, Jacinto says no two days are alike. "It's a lot, but I love it all," he said. "I like being around the kids and I like being around the coaches. The relationships you build are priceless, and getting to see the development of the kids and our student athletes, the development of our coaches, and giving feedback to help our coaches and student athletes get better." Growing up in Waco, Jacinto always loved sports - football, track, and especially basketball. He set his mind on attending Baylor University where he majored in business, but the advice of one of his own high school coaches stuck with him and helped set his post-graduation course. "He said, 'I think you would be a great leader. You need to be a coach'" Jacinto recalled. "And that's when I decided that that's what I wanted to do. Even though all my family were educators and coaches, that's when it came to me, from my high school coach." Growing up, his parents and grandparents instilled a strong work ethic in him, encouraging him to develop his talents and interests, but also to always look for ways to serve others. He's tried to instill that same balance - between passion and drive - in those he's coached and worked with over the years. "In everything you do, you compete, and you're not always going to win, but if you're better prepared, you're going to win more than what you lose," Jacinto said. "You're not always going to be motivated, but you better be disciplined every day, because that's how you're going to have success." According to Spring ISD Director of Athletics Willie Amendola, Jacinto works hard to walk his talk and back up his philosophy with action. "Coach Jacinto is the consummate professional who serves the community in a number of ways," Amendola said. "Becoming a Certified Athletic Administrator is another example of his behind-the-scenes commitment to our students, parents, coaches and community. We are fortunate to have such a selfless, dedicated administrator." Rather than saying he's going to work, Jacinto will often tell his wife - a retired educator and a coach herself - that he's "going to school." It's a subtle reminder that he's still learning, too, that he's still working each day to keep upping his own game, to keep getting better and better at what he does. "I'm so grateful for all the support to help me get to where I am today," he said, "for my wife, my family, for Coach Amendola and all my fellow coaches. I've learned something from every single one of them." Gesturing at the certification on the wall, he added, "That thing should have more names than just mine on it."